Enjoy the bushveld atmosphere, peace, hear birds calling, bushveld sounds and murmuring of the river. Relax in a peaceful atmosphere between the mountains, alongside the Crocodile river where you still can hear the cry of the Fish Eagle, a paradise for birding, hiking, fishing, moutain cycling and hiking routes with spectacular views of the Madibeng district. The Park with neat ablutions is situated conveniently 7km from nearby town Brits with shopping facilities and Brits Mall. We are about 60 min. drive from Pretoria and 90 min. from Johannesburg. 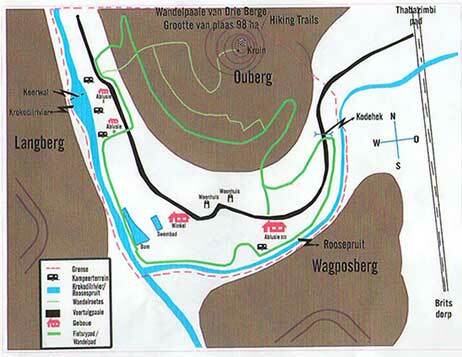 Our campsites amidst mountains, bushveld and river give you an experience you will come back too, time after time! We are security-fenced, electrified and patrolled. We are also linked to a security reaction force. 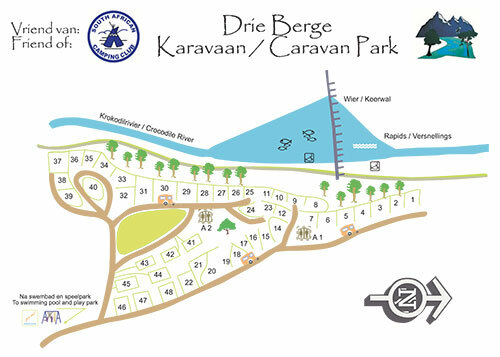 Drie Berge Caravan Park is located 7 km outside Brits, 60 km from Pretoria, 90 km from Jhb, between Drie Berge on the banks of the Crocodile River. Come and experience the tranquil bushveld atmosphere with the sound of the whirlwind stream, over 100 bird species and the call of the Fish Eagle. PLEASE NOTE: DURING JULY, OFFICE WILL BE OPEN FOR RESERVATIONS ONLY.